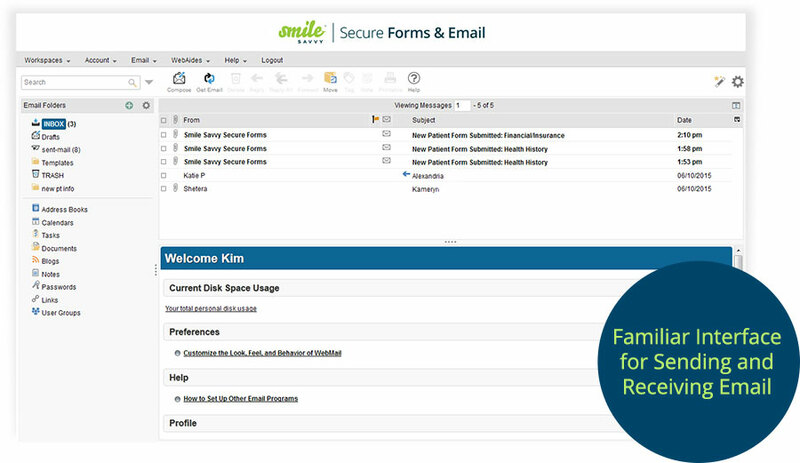 It’s never been easier to have a HIPAA-compliant email to send ePHI information to patients and other doctors. It is increasingly common for dentists to email Electronic Protected Health Information (ePHI) back and forth to insurance companies, patients or other doctors. Unfortunately, the majority of dentists are doing so without following proper HIPAA protocol. 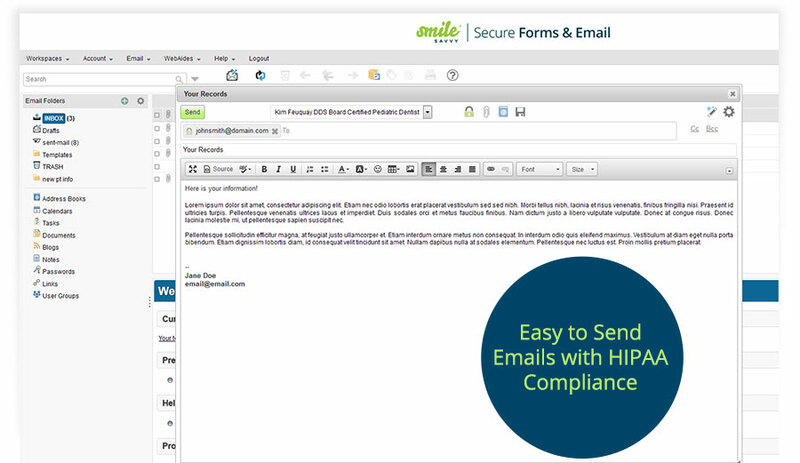 Smile Savvy provides encrypted email that is 100% HIPAA-compliant, so you can rest assured that your emails are delivered safely and securely to their intended recipient. Additionally, others can send you secure emails via your website, or in your email signature through a secure portal. Our encrypted email service operates as seamlessly as regular email and can integrate with your existing Gmail, GSuite or Office 365 emails. Read more about our features below. Our Encrypted, HIPAA-Compliant email is included with all new websites or purchased separately for just $10/month. Our encrypted email is more advanced than most, making it easier for you to send sensitive information. We can send an email one of two ways: 1) using TLS, we can send an email that decrypts when it arrives in the recipients inbox; 2) the recipient gets a link to the encrypted email without the need to enter a password. Our emails are HIPAA compliant and meet all of the security regulations necessary to keep your emails safe and secure. For added security, you can share a link on your website and in your email signature with doctors, insurance companies, or patients, which will allow them to send you an email through your encrypted email. This protects both you and the sender. If you use Gmail, Gsuite, Office 365, or even Outlook, then you don’t have to change your emails. We can install a plugin to any of those tools to add encryption on top of what you’re already using in just a few minutes. Encrypted email is required by HIPAA to send information containing Electronic Protected Health Information (ePHI) such as x-rays, patient treatment details, insurance information, etc. It is also used to send secure information such as social security numbers and credit card information. How does the recipient see the email? Typically, when you send an encrypted email to someone, they will receive it just like any other email. This is possible due to a technology called TLS (Transport Layer Security). Most free web clients such as Yahoo, Gmail and Hotmail support TLS. Alternatively, we can also send them a link with an email branded to your practice that opens the email into an encrypted, secure portal. Can other people send me encrypted emails? By default, another user cannot send you an encrypted email unless they have an encrypted email service themselves. Encrypted email simply secures your emails that are sent out as well as any emails contained inside your email client. In order to have other people send you an encrypted email, we can setup a link on your website and add it to your email signature for them to reply back securely. How does this affect our current email addresses? Your current emails remain the same and will continue to be used for sending and receiving emails that do not contain Electronic Protected Health Information (ePHI). We do have the ability to encrypt your existing emails based on the type of email provider you have. Some practices would rather keep their email separate from other communication, so we can set that up as well. Can I use an existing email address for my encrypted email? Yes! We have a new feature that allows us to encrypt your existing emails. If you use Office 365, Gsuite or Gmail we simply install a plugin that allows you to encrypt any email you send out. Additionally, if you have your email (regardless of where it’s from) setup via Microsoft Outlook, we can add a plugin to Outlook to encrypt any outgoing email. These emails will send to the recipient as a link to open in a browser.